Danforth handles a wide range of Process, Industrial, and Power Piping Installations and Fabrication for various customers. We have the knowledge and skilled craftsmen necessary to work on these complex systems. We currently hold certifications for the ASME “PP”, “R”, and “S” Stamps. Our experienced fitters, fabricators, and certified welders regularly perform all facets of process piping and industrial piping replacement and installation. Our services include threaded, soldered, or welded installations of Plastic, Steel, Copper, Carbon, Cast Iron, PVC, Fiberglass, and more. Our technicians are experienced with chemical conveying and food processing systems as well as water, wastewater, steam, and condensate, and other process-intensive applications. We have years of experience in performing chemical plant shutdown work around the clock, to meet your schedule. We understand the importance of quality and timely installations, especially when our customer’s production schedule is in jeopardy. Through our “State of Readiness” motto we are able to respond to a customer’s needs both timely and efficiently. Whether it’s a new installation or repair to a system, we are ready for the challenge with professional management and expert craftsmen. Danforth’s state-of-the-art Pipe Fabrication facility uses the newest technology and equipment for fabricating piping systems. We are capable of performing installations with many different types of materials and joining methods. We are members of the National Certified Pipe Welding Bureau and meet their standards with every weld. We have perfected many different welding procedures using highly skilled union welders to complete the work. 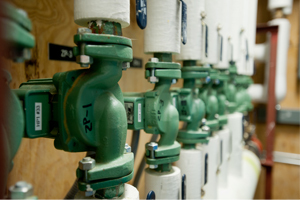 Start Your Process Piping Project with Danforth. Meet with one of our Process Piping consultants. We’ll outline our process and begin your project estimate. Need More information? Send us a quick message and we’ll reach out to you to help plan your next Process Piping project. Get answers about our Process Piping services and speak with a knowledgeable Process Piping Expert.